"[A] novel in a similar vein, atmospherically, to The Night Circus and The Snow Child and given its complexity, bizarreness, and otherworldliness, comparisons work best when trying to describe it." The reason my blogging has been so patchy: I got myself two furry friends of the rabbit persuasion. And rabbits, especially during the lengthy teenage months when they are chewing, thumping, and making other moves for which the politest translation is ‘voulez-vous coucher avec moi’, take up a lot of time. We’re now out the other side, and it is wonderful to be able to pick up a book again for more than a short period. In November I didn’t finish any books but I did read a couple more chapters of Brick Lane. And I started Outlander, which I’m 200 pages into and enjoying. I may have lost the edge of Brick Lane‘s jacket to the discovery stage of A Practical Study into the Composition and Taste of Paper, a project thankfully since abandoned. My plan for December includes finishing Outlander and watching the first TV season so long as only the first book is covered, reading at least one more Christmas book to accompany my nonseasonal (October) reading of the Jenny Colgan I’ll be reviewing in a few days, and making an hour or two to re-read a childhood favourite – Babysitter’s Club #21, which I discussed in 2016 as a book I’d like to re-read if I could find the box I’d packed it into. The box has since migrated to a spot in front of my shelves. If there is time after the above I have an as yet unwrapped set of A Song Of Ice And Fire. In related news, I attended the Young Writer of the Year Award ceremony yesterday evening. The prize was given to Adam Weymouth for Kings Of The Yukon. This is the first year since the relaunch that I’ve not read any of the shortlisted books, however I took home with me a copy of Fiona Mozley’s Elmet which I hope to read by February. I’m going to use these next weeks before Christmas to get back into the swing of things. Expect a few reviews and, hopefully, a discussion post or two. What are you planning to read during the rest of this month, and have you ever lost part (or all) of a book to a pet? Congratulations on your bunnies! They have the softest fur. We had one as a pet for ten years, and I still miss him (although not enough to raise another now). Keeping rabbits sounds hard work – but fun. I had to own up at the library once that my dog had chewed some of the pages of a book I’d borrowed. 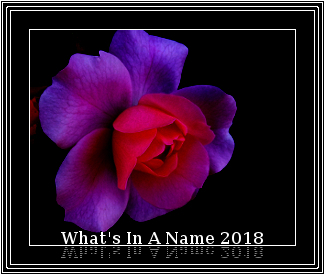 Just wondering if you’ll be hosting the What’s In Name Challenge next year? I don’t think I’ll complete it this year as I still have a title beginning with Z to read – and I can’t see myself having enough time. I am not a Pet person, but love animals. Too hard work to jeep, so I understand that you have ben busy. I love Outlander, read all the books and sen the series. Still, I think the first book and series the best. I usually don’t plan, just grab the book I am in the mood for. Bunnies! How fun! We had a few when I was growing up. We have nine dogs (all rescued) and another has wandered up this week, so it looks like we might now have ten. There’s also the possibility of a kitten in the mix, that was also abandoned. (hoping it will find another home) There are some horrible people in this world. Aw Charlie, I hope you having lots of fun with our new furry friends! This month, I am looking forward to a comforting re-read of Emma by Jane Austen, as it was my result for The Classics Club’s recent Spin event. Jeanne: Thank you :) Ten’s a good age! I can relate to you not wanting another; I think these will be my only two, with the amount of things that can possibly go wrong! Margaret: Your library book, oh dear! I think at least libraries often put damaged books out for sale. I won’t be hosting WIAN, no – I didn’t really have the time last year if I’m honest but no one’s come forward to take it over as yet. (I’ll probably post about it before the end of the year; I’ve tweeted already). That’s fair enough :) I’m not sure I’ll have time either. Freda: Hehe! They do need planning when you travel; if taking them with you is a possibility I suppose that works. Kelly: Wow, nine dogs! That is amazing, though it must take a while. Lovely to hear that they are rescues. Those stories can be awful. Jessica: Thank you :) That’s an excellent spin result, indeed very comforting!